This history was commissioned by Evan Christian, resident of Number 10 Rarere Road. Rarere Road is a short street in Takapuna on Auckland’s North Shore. It runs off Ewen Street near Hauraki Corner, on the east side and near the bottom of Ewen Street, parallel to the coastline. It is not recorded why the street was named Rarere. Other streets in the immediate vicinity with Māori names include Hauraki Road, Hororata Road, Onepoto Road and Rewiti Avenue. It is possible that the street was named after the Auckland yacht Rarere, which was built in 1895 by Robert Logan Snr  and raced with some success on the Waitemata Harbour, but there is no evidence that this is so. Rarere means the travelling of the sun. It is “a word which can be interpreted as the sun flying swiftly. However, if ‘rere’ is a cascade, waterfall, or even shallow water, the word could mean a sunlit shoal, or sun on the water”. 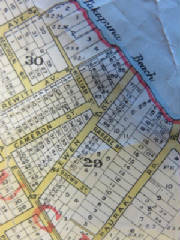 Rarere Road was formed some time prior to 1913, under the aegis of the former Waitemata County Council. At a meeting of the Council on Friday 14 March 1913 it was stated that “the dedication was accepted of Rawhiti and Rarere Roads, as the roads had been constructed in accordance with the approved specifications”. However, Takapuna was officially constituted as a borough on 1 July 1913, after 1124 electors out of 1546 voted overwhelmingly in favour of independence from the Waitemata County Council. At a meeting of the Takapuna Borough Council on Wednesday 19 November 1913 “the Mayor stated that the roads had not been formed in accordance with the conditions of the county council, and therefore moved that the chief surveyor be communicated with, advising him to refuse to accept the deed of dedication, and that he be asked to have the roads constructed in accordance with such conditions”. The differences between the two councils apparently related to the gravelling of the footpaths, and must have been sorted out because at a meeting of the Takapuna Borough Council on Wednesday 28 January 1914 it was resolved that “the Council will endorse its consent to the dedication of Rawhiti and Rarere Roads” ; and at a subsequent meeting on Wednesday 11 February 1914 that “the Borough Seal be affixed to the Deed of Dedication of Rawhiti and Rarere Roads”. Subdivision must have begun prior to dedication of the road, as Samuel Vaile and Sons advertised the sale by auction on Friday 23 February 1912 of “4 magnificent large residence sites fronting Rarere Road” at “Takapuna the Beautiful”. 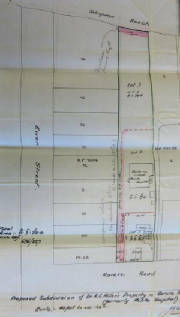 On 28 November 1922 Foster & Miller, an Auckland firm of licensed surveyors, submitted to Takapuna Borough Council a proposal for subdivision of land on the seaward side of Rarere Road (see fig. 1). 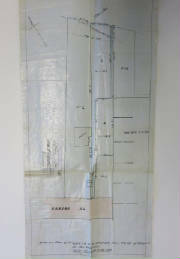 A 1925 Lands & Survey map of Auckland and environs shows this first subdivision (see title-page). A very early resident of Rarere Road was “Mrs. Upton”, who advertised for “mother’s help” in June 1917  but who has not otherwise been traced. The first residents listed in the 1919 Waitemata Electoral Roll as living in Rarere Road were Charles Willard McBride (who gave his occupation as farmer) and his wife Evelyn Mary McBride, and John Frederick Colegrove (tea merchant) and his three children Mary Josephine Colegrove, Constance Melita Colegrove and John Selwyn Chettle Colegrove. 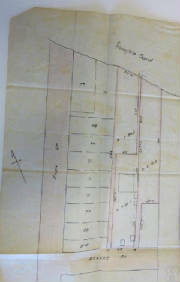 On 16 April 1929 Foster & Miller submitted a plan showing the location of a residence to be built for the Colegroves (see fig. 2). Rarere Road did not have street-numbers until after 1950, so it is not possible accurately to match early residences with those of today. However, the Colegroves continued to live in Rarere Road until about 1952, when they moved to Remuera. Other early residents of Rarere Road included Edward Bourne (accountant, about 1922), Harold Anthony Broadbent (dentist, about 1921), William H. McEwan (labourer, about 1924-1925), Allan Rowe (commercial traveller, about 1922-1923), Robert Walter Scott (warehouseman) and his wife Ivy Julia Scott (about 1921-1931) and Geoffrey William Waymouth (sales manager, about 1922-1928). The Shirley Nursing Home was established in 1936 at about what is now 9 Rarere Road (see fig. 3). The licence to operate as a “five bedded hospital to receive up to five medical or convalescent cases, or up to four maternity cases and one medical or convalescent case” was approved by the Inspector of Private Hospitals on 1 June 1936. The advertisement was signed by Miss M. Earp, R.N. Sister Millicent Earp had registered as a maternity nurse on 1 June 1927, training at the Inglewood Nursing Home at Kingston-on-Thames in south-west London. She emigrated to New Zealand in 1926. The Nursing Home probably took its name from the Shirley Private Hospital in Pukekohe, which Sister Earp purchased soon after her arrival. In February 1937 a bedroom for a sixth patient was provided by closing in a sun porch with whitney windows; and in July 1937 a cottage on the grounds was licensed for a nurses’ home, with an annexe licensed for an additional medical and convalescent patient. In July 1940 the hospital was licensed to admit up to nine patients, including up to six maternity patients. situated in the best part of Takapuna, with valuable frontage to Takapuna Beach and Rarere Road, off Ewen Street. Only a few minutes’ walk to shopping centre and bus stop, Hauraki Road. Land comprises 3 roods 28.4 perches, with frontage of 80ft to Takapuna Beach and same to Rarere Road, by a depth of over 500ft. Land would lend itself well for subdivision. Buildings: Substantial, well-built, commodious Dwelling of 10 rooms, bathroom, lav., kitchen, scullery, etc. ; annexe comprising 7 rooms, bathroom, lav. ; outbuildings with outside lav. “MELITA” is now occupied as a Maternity and Convalescent Home. Well equipped in modern furnishings, fully supplied with blankets and linen of best quality and equal to new, a large quantity never having been in use. Large frig., elec. stoves, elec. hot water, incinerator. MONDAY, MAY 29, 1944, AT 11 O’CLOCK. The sale was finalised on 20 June 1944, selling for £5,000 (including £600 for goodwill) to Rev. James Kirk Reid on behalf of the Melita Healing Fellowship to be “a Christian Home of Healing”. According to the sale documents “the buildings comprise a nursing home of 8 bedrooms, sitting room, nursery and all conveniences, nurse quarters in a separate building and a converted garage also used for nurses’ accommodation, wash house, wood shed and lavatory and storeshed”. It was stated that “the hospital on the site is the only private hospital in Takapuna”. The maternity side of the business then ceased, with the last births taking place in August 1944, but Melita continued as a private hospital under the charge of Sister Violet May Challis (March to September 1944), Miss Lilian Sarah Laycock Davidson (October 1944 to February 1945) and Mrs Ada Kathleen McConnell (February 1945 to July 1946). During this period the hospital, then known as the Melita Medical and Convalescent Hospital, was increased first to 10 beds (1 November 1944) and then to 12 beds (23 January 1946). There was also a chapel on site, as in April 1945 the New Zealand Herald carried an advertisement for a service to be held at the Melita Healing Fellowship Chapel, Rarere Road on Friday 20 April 1945. On 25 June 1946 the hospital was purchased from the Melita Hospital Trust Board, which had been incorporated on 25 July 1945, by Miss Helen Mary Morgan Collinson for £6,850 including goodwill of £600. However, the licence to operate as a private hospital was surrendered on 5 August 1947. From 1948 to about 1951 “Melita” at 9 Rarere Road was the residence of Andrew Campbell Miller, an ear, nose and throat surgeon who had rooms in the Lister Building, 17 Victoria Street East, Auckland. “Melita”, Dr. A. C. Miller’s former home in Rarere Road, Takapuna, was opened last week as a 12-bed private hospital. It will cater for acute medical, but not surgical, cases. Miss M. [Millicent] Murden, a former matron of hospitals in Britain, is matron, and Miss R. [Rita] Pearce, who came to New Zealand with Miss Murden six months ago, is deputy-matron. Both are State registered nurses in both Britain and New Zealand. Melita had thus returned from its brief function as a private residence to its former role as a private hospital. By 7 May 1954 alterations to convert the hospital to a medical surgical unit had been completed. Between 1955 and May 1956 there were further alterations and extensions, with the number of licensed beds increased from 11 to 15. In June 1956 the license was transferred to Mrs Sarah Swanson (Cissie) Morton (née Hulme). In 1957 applications were made for loans to undertake additional alterations and extensions, including an increase in the size of the operating theatre. In May 1958 Miss Gladys Margaret Burton was appointed manager of the hospital. In September of that year the alterations were completed, and the number of licensed medical and surgical beds was increased from 15 to 18. On 7 September 1959 the license to operate was transferred to Miss Betty Esma Popple, on 17 October 1961 to Mrs Lily Mabel Hughes, on 19 November 1962 to Sister Jean Margaret Galloway, on 9 August 1963 to Miss Clare Evelyn McCulloch, and on 20 December 1963 to Miss Edith Margaret Daly. On 11 May 1964 the Directors of the Melita Hospital wrote to the Auckland Hospital Board, asking if they would like to purchase the Hospital for £22,500 plus contents. The Board declined the offer on 15 June 1964. On 10 August 1964 the hospital was closed because of “a substantially reduced bed-state which resulted in the Company incurring considerable losses”. On 12 November 1964 the property at 9 Rarere Road was put up for auction but failed to reach the reserve. Following the auction negotiations were entered into with the highest bidder, Mr Gordon Stanley Morris and his wife Mrs Beverley Anne Morris, and an agreement for sale at £13,000 was drawn up. Mr and Mrs Morris indicated that they intended to operate it as a rest home, not as a medical hospital. On 30 November 1964 the license to operate the Melita Private Hospital was formally cancelled. In December 1965 the company Melita Hospital Ltd was wound up, and subsequently struck off the Register of Companies on 24 July 1966. On 18 October 1966 Bev Morris’s request for a license to operate Melita as a rest home was declined, but following improvements being made, a license for up to 11 residents was granted on 7 April 1967 and regularly renewed thereafter. On 19 July 1976 Miss Monica Watt was approved as Resident Manageress, and on 19 October 1981 the number of licensed beds was increased from 11 to 12. Melita Hospital continued as Melita Rest Home at 9 Rarere Road until 1984, at which time it was closed and its license to operate as an old people’s home cancelled. The properties were sold by the Morrises (who also owned Number 8), the buildings pulled down, and the properties redeveloped by a developer. As with other neighbourhoods, the residents of Rarere Road were a mixture of the long-established and the more transient, the latter facilitated by the Livingstone Court Flats at Number 6 from about 1949 to 1971 and the Winstone Flats from about 1956 to 1958. The residents who lived the longest in Rarere Road were the Coupe family. Draughtsman Charles Edward Coupe lived at Number 1 (previously numbered 2) from about 1938 to about 2001; Kathleen Coupe from 1954 to about 2011. Others living at the same address over the years were Herman Bennett Coupe (company manager) and wife Elizabeth Coupe, Beatrix Mary Gerard Coupe, Anthony C. B. Coupe, Richard Andrew B. Coupe, Teresa Anne B. Coupe and Alexandra Mary Coupe. Malcolm Drummond, whose occupation was variously pastrycook, ferry master, salesman, land agent and property manager, lived at Numbers 8 and 4 with his wife Monica Kotska Drummond from about 1946 to about 1996. Gordon Stanley Morris, a refrigeration engineer and company director, lived at Numbers 9, 8 and 6 with his wife Beverley Anne Morris from about 1965. Widow Josephine Isabel Pavitt lived at Numbers 10 and 5 from about 1946 to about 1964. Driver and taxi proprietor Ian Wightman Rule resided at Numbers 6 and 3 from about 1948 to about 1985; his wife Muriel Gwendoline Rule from 1948 to about 2008; and their children from when they were very young until they left home, with Leslie Louise Rule having lived in Rarere Road for her entire life and still living there. Chemist and company director Aubrey Ashton Webster and his wife Marjorie Petrea Webster lived at Number 7 from about 1961 to 2003. A list of residents is given in Appendix 1. Takapuna City Council is taking a property owner to court claiming excavation work damaged protected pohutukawa trees on a beachfront property. A second tree on the Rarere Rd site fell last week, knocked down by bulldozers in the early hours of the morning. The council allowed the tree to be removed because digging near the base had made it unstable. Residents, police and mayor Wyn Hoadley gathered at 6am last Thursday as the pohutukawa fell. The bulldozer driver was persuaded not to knock down another tree whose protected status had been lifted because of the excavations. Four protected trees remain on the property. When is a protected tree protected? Never, it seems, if a council allows itself to be out-manoeuvred by a developer who’s not too worried about the present negligible consequences. Residents of Rarere Road Takapuna were rudely awakened one Thursday morning at 6.30am to find a digger demolishing a stand of protected pohutukawas on a residential building site. The job was being carried out, surreptitiously, by torchlight. Only the combined efforts of neighbours – among them Takapuna mayor Wyn Hoadley – police, and the threat of legal action by neighbour Aubrey Webster prevented more trees from being felled. As it later turned out the removal of the trees had been authorised at a council meeting at which Wyn Hoadley had been present – a week earlier. Assessment by the Parks Department concluded that the trees although badly knocked about would survive and therefore building would continue. One of the trees was later toppled by Cyclone Bola – “a tribute”, according to Mr Webster who had unsuccessfully tried to pre-warn the Planning Department, “to inadequate planning and gross inefficiency on the part of those whose job it was to protect them”. On May 4th Council lifted the protection of four of the trees allowing Mr Tedcastle to remove them but informed him that Council would prosecute “on the basis that actions of the developer have caused (two of) the trees to be so unsafe that they have to be removed”. Prosecution proceedings were also commenced for damaging a fifth tree, while another collective group of trees had to have remedial treatment to prevent further prosecution (ie: clay covering their root systems removed). It is unfortunate that this development has gone ahead with little concern for the trees’ health and safety, but I feel that from this situation a policy should be put into force for trees in similar situations to be protected in the future. Developments of property are a major cause of the decline and death of trees. The tree roots are usually damaged in excavation and the change in the water pan. Soil, timber, buildings and heavy machines are often placed over the top of the tree’s base, crushing the non-woody roots or preventing the trees from respiring. These mechanical damages are usually disguised with landscaping, therefore after several months have lapsed it is difficult to know what has occurred in the past. However, as time passes the effects of excavation are shown by the tree declining or completely dying. The question arises: how can trees protected in two ways, by caveat and by council, still be open to this kind of destruction? “Council could have demanded that the earth was replaced around the remaining trees and supported with concrete retaining walls”, says Mr Webster. “Even if, as has been suggested, mature trees are planted in their place, it still takes two to three years before they re-establish new roots. The house was designed so that what has happened was inevitable”. A previously protected Norfolk pine tree near Takapuna Beach has been chopped down after its roots were cut to make way for a townhouse. Contractors felled the tree, estimated at up to 30m tall and protected in the district plan, on Wednesday, on orders from the North Shore City Council. A tree specialist had advised the council that with 40 per cent of its major roots severed, there was a risk of the tree falling in high winds. Its roots were cut on one side when a building platform was being excavated for the townhouse in Rarere Rd. The tree was only metres from the half-completed building. A protected tree in Takapuna was last week given the chop after excavators destroyed its root system. Up to half the Norfolk Island pine’s roots were chopped off when an excavator was doing work on a new house being built in Rarere Rd. The 70 year-old tree has been listed as a protected tree for more than 30 years and architects Jessop Townsend designed the house to accommodate the tree. Spokesman Peter Townsend says they had tried to position the house far enough away from the tree to ensure the major root system would be undamaged. “At the end of the day it seemed to be the most prudent thing to do. We’ve been aware since we started that it was a listed tree.” ... Many local residents are upset carelessness has cost the life of a tree that is a landmark and part of the area’s history. Apart from building permits (see Appendix 3) and trees, most recorded interactions between residents of Rarere Road and the Council (Takapuna Borough Council (1913-1961), Takapuna City Council (1961-1989), North Shore City Council (1989-2010) and Auckland Council (2010–) were over the state of the road and footpaths, drainage, and access from the road to their properties. In June 1933 Edward George Eckett wrote to the Council that “the road at the end of Rarere Road is being used as a dump for garden refuse”, and offering to “see that it is kept clean if Council will clear the rough growth for a few yards”. Council agreed to undertake this work. In June 2009 the Council refused to issue a code compliance certificate for the two-storey house constructed in 2003-2004 at 6A Rarere Road on the grounds that the monolithic cladding did not meet the Building Code’s standards for weather-tightness and durability. The owner appealed to the Department of Building and Housing, which in its Determination 2009/88 dated 13 December 2009 ruled that the building complied provided that specified modifications and repairs were undertaken. free and perpetual right of ingress egress and regress on horseback or on foot and with or without implement and vehicles of every description loaded or unloaded by night as well as by day ... for the purpose of giving access to and from [the properties] and to and from the public road ... for all purposes whatsoever connected with the use and enjoyment thereof. The owners of Number 10 – the Christian Family – had young children and wanted to erect a second gate further down the shared drive for the safety of their children. The owners of Number 9 – the Gregory Family – objected and the dispute escalated, encompassing the existing gate at the top of the drive. The neighbours were unable to reach agreement, and one of the top gates was removed, thereby rendering the other inoperable. The High Court judge issued a preliminary decision not to grant an injunction requiring the gate to be reinstated, pending a future substantive hearing. The application for the substantive hearing was subsequently withdrawn. Boats and bonfires. Having Takapuna Beach for your front yard makes for wonderful childhood memories. As a youngster, John learned to swim in the sea off his front yard and to surf, windsurf and sail – and put out unplanned bonfires on Guy Fawkes nights. His front yard was Takapuna Beach, accessed through a gate at the bottom of an expanse of lawn in front of his parents’ home. John was 5 years old when his parents moved there with his brother Mike and sister Jacqueline, and John finally moved out at 22 only because he thought he was a bit old to still be living at home. His parents [Aubrey and Marjorie Webster] remained at the house until they died – John’s father passed away three years ago, and his mother followed two years later to the day. John and his siblings are now selling their family home, a 1940s treasure on a generous 1480sq m section. “I have visions of my brother’s P class catamaran on the lawn after a day’s regatta, and of other yachts and windsurfers and surfboards lying everywhere. On Guy Fawkes nights there were fires all the way down the beach. There used to be toi toi all along the front of the houses, and every year they’d catch fire. We started hosing them down before people set off their fireworks”, laughs John. At the end of a long driveway, and with houses behind it, this house is sheltered from the predominant southwest winds. “Now and then we get a howling nor’easter and it belts the windows, and that’s really quite fun, I enjoy it”, says John. “After a storm we might get glassy waves rolling in and there are surfers everywhere. The sea is ever-changing and there’s always something to watch. Even the sand is always shifting”. The house was built long across the section so that all the main rooms look out to that classic North Shore view. On the ground floor is the kitchen, dining and living room, which flows through to a den that can be separated from the main living space by sliding doors. Floor-to-ceiling wood panelling on most of the walls is a distinctive feature. This is repeated in the staircase, which has a banister a little like the bent branches of the pohutukawa outside. “It was great for sliding down”, grins John. Half way up is a doorway allowing access to a flat above the garage; at the top are three bedrooms, each soaking up the sun and the view. The master has a dressing room and en suite which, considering they were added in the 1970s, are ahead of their time. A doorway from the master bedroom allows access to the upper terrace. But it was the lower terrace where John recalls many social gatherings as the sun went down. John’s brother Mike remembers the sense of community among people who regularly walked themselves and their dogs up and down the beach. “Our parents walked every day and swam every day in summer”, recalls Mike. The family had a dog, Jess, who Jacqueline says “owned” the beach. “When they tightened the laws the dog catcher got to know her so well that he’d deliver her home and she’d jump out of the truck as happy as Larry, tail wagging like mad”, says Jacqueline. The siblings’ parents initially also owned the property to the left of the house as you look out to sea, and when they sold it placed covenants upon the land to prevent future owners from building too far forward and blocking the view from No. 7. John is aware that the buyer of his parents’ home may want to demolish it to build a new house, or a developer may want to realise the potential of such a large site. He’s had visuals drawn up to show how a single, three-level dwelling could sit beautifully on the land. He quietly hopes that whatever becomes of his old home will be tasteful, and in keeping with the beach lifestyle he loved while growing up. Size: Land 1480sq m, house 290sq m.
Bedrooms 4, bathrooms 2, garage 2. Price: Upwards of $6 million. Features: Two-level 1940s home on Takapuna beachfront with unobstructed views. Separate flat above garage. Oil heater fire in lounge, den can be closed off from lounge, separate dining room. Terraces and large lawn with gate access to beach. Uninterrupted views, a sweeping lawn and gates to the beach. Properties fringing Takapuna Beach are amongst New Zealand’s most desirable assets to own, a solid investment option that over recent years has seen incomparable rises in value. 7 Rarere Road, Takapuna Beach, available for the first time in 20 years, is one of the last true opportunities to purchase an irreplaceable waterfront position, with such tremendous potential. The original and much loved 1940s beach front home is situated on one of the last full (1480sqm) beachfront sites. From every aspect there are the most stunning, completely unobstructed, sweeping sea and coastal island views. From the bottom of the lawn, step through your own garden gates onto golden sands, where you can swim, surf or sail, or simply walk the beach to relax, enjoying a sunny summer lifestyle. Rarere Road has huge potential to utilize as a platform from which to design an ultimate home, that would surely transform it into one of Takapuna Beach’s finest lifestyle estates. Or to landbank and hold, and invest in an area of certain capital gain. Property such as this are tightly held, and very rarely come to the market. 4 bedroom house with 3 bathrooms. Entertainer’s dream with extensive views over the Hauraki Gulf. Property is available fully furnished or unfurnished. Price is negotiable! Private access to Takapuna Beach. 3 story townhouse with 4 double bedrooms and 3 bathrooms. All bedrooms have wardrobe systems. Large master bedroom with an en-suite and walk in wardrobe. Multiple decks and living areas with views not to be missed. Immaculate presentation in a prime location. An architect-designed home sits in a private oasis just back from Takapuna Beach. Tucked down a right of way and with a bland façade, there’s nothing remarkable about this Ron Sang-designed home as you approach from the road. Except for the towering, bright red front door that hints at what might be on the other side. “It was the tallest door in the country when this place was built – I’m not sure if it still is”, says owner Perry Macdonald. Once that door is open, the logic behind the house turning its back on the neighbours, the road and the south becomes apparent. The northern side of the home is almost entirely glazed to make the most of the sun and the sea views out to Rangitoto Island. The three-level home has a curved central atrium over two storeys with a domed skylight roof. There are two wings off the atrium. The deck on the middle level zigzags along the entire face of the house and overlooks the in-ground saltwater pool. The middle level is the hub of the home with kitchen, dining and living rooms. The upper level has two bedrooms, one in each wing, connected by a gangway that cuts through the atrium. Both the upstairs bedrooms have their own en suites and balconies. The bottom level flows out to the pool and has two more bedrooms, a media room and a lounge with a kitchenette. The pool, as well as having a spa pool built into one corner, has an island in another corner as a setting for outdoor dining. Perry has lived in the 17-year-old home for about 10 years and says the design and the materials have stood the test of time. “The thing about it being a Ron Sang house is that it just doesn’t date, she says. “The guy who built it apparently had heaps of money because it’s made of solid concrete – even the garage has slate tiles on the floor. The wiring and technology that went into the place were really advanced for those days”. Perry says very little work has needed to be done on the home in the time she’s been there – apart from the interior colour scheme. “It was very 80s – greys and pinks – which we changed quite rapidly”, she smiles. And the garden around the pool, which was mainly natives, has been revamped by award-winning designer Ted Smythe so that it is lower maintenance and more pool friendly. Perry says it’s been a great home for entertaining and has been ideal for her teenage son and daughter, who made the downstairs their own. “It’s great for teenagers – they can be partying downstairs and you just don’t hear any noise”, Perry says. “And the best thing about this house is that it’s not only got beach access but you can also swim naked in the pool if you want to because it’s so private”. Size: Land 1103sq m, house 520sq m.
Price: Interest expected above $3.5 million. Features: Sprawling sold concrete home over three levels designed by Ron Sang. Sea views, triple garage with internal access, underfloor heating, security system, in-ground saltwater pool and spa pool. Direct access to Takapuna Beach. Nearly ½ an acre of prime Auckland beachfront? An inspired Ron Sang designed family residence? Approx. 5500 sq ft of total luxury combined with extensive tropical landscaping and heated pool? Words alone will never describe this spectacular beachfront property!! Auction on site 2pm Saturday 7th Nov ’98. At the south end of Takapuna at the weekend, 10 Rarere Rd was passed in at auction for $3.3 million and sold immediately afterwards. This property is breath taking, beach front it combines sensational sea views whilst retaining privacy. The decked outdoor pool area is the perfect spot for enjoying the sun. I love how the property opens up on a central courtyard and creates another great family space. Set on a sprawling 1,975m² site on Takapuna Beach this sensational waterfront residence is positioned to maximise the breath-taking sea, beach and Rangitoto Island views. Originally designed by Ron Sang and built of solid brick, the current owners have recently completed a magnificent renovation working together with Julian Guthrie of Godward Guthrie Architects. The result is an aesthetically spectacular balance of light-filled spaces with clean lines, floor to ceiling glass, bleached floors, both dramatic and intimate beach and sea views and fabulous tropical landscaping. In essence – one of the North Shore’s finest homes. The second most expensive home sold this year  was on Rarere Rd in Takapuna, which went for $8.5 million – $1 million over its valuation. The beachfront stucco house, built in 1989, has four bedrooms, two bathrooms and an infinity pool and sits on a 1975sq m section. This ocean front estate sited on 1975m2 has a majestic position flowing to the sands at Takapuna. It is hard to beat!! In 2008 renowned architect Julian Guthrie created a magnificent four bedroom home of international standard by remodelling the classic 1980s original home. The spectacular view unfolds as one enters the 14 metre long living/dining room with floor to ceiling glass. The adjoining generous kitchen is also a work of art (with top of the line European appliances). From here, also enjoy the extensive Channel and Rangitoto views. Downstairs is a majestic main suite, plus an entertainment room, which both spill out to extensive decking, an infinity pool and the gently sloping lawn which extends directly to the beach below. There is also an area to house a seven metre boat, plus garaging for three cars and generous space for guest parking. The private central courtyard with fireplace is perfect for alfresco or evening dining. People enjoying a stroll along Takapuna Beach might envy the luxury of those who live there permanently. Its recreational features are strong and its water views among the best on the Auckland isthmus. As well, the shore housing at Takapuna has high prestige. Now that prestige status is spreading to streets close to the beach where, increasingly, older homes are being replaced by classy upmarket styles. The residence at 11 Rarere Rd is a typical example. The imposing, two-level executive family house is a short walk from the beachfront. Its New England style is highlighted by a spacious free-flowing interior and indoor-outdoor connections. Inside, the architectural lines are clean and unfussy. Lightness and brightness comes through an abundance of french doors and windows and a fine balance of interior decor and soft furnishings. The rooms are generously spaced on both levels. At ground level the layout includes a spacious formal foyer, a bedroom/study, a large formal dining room with three sets of french doors, a family lounge-dining room and country kitchen, a bathroom, two-car garaging and a studio workshop. All the living areas and the kitchen open up to a deck and private grounds at the rear of the house. The rooms upstairs comprise three bedrooms, two bathrooms and a study. The master bedroom has an en suite and a walk-in wardrobe. It also opens to a deck looking out to sea views. Interior highlights include the use of matai flooring in the kitchen and bathrooms. Halogen lighting is strategically placed throughout the house for variable night mood settings. Around the house are areas of formal lawns, landscaped gardens and a lily pond. The property has an asking price of $915,000. Brimming with character, this 20 year old home has undergone a full transformation to meet the highest specifications, right down to the Trends Magazine award for Kitchen of the Year for this truly amazing Chef’s Kitchen. The large adjacent Butler’s pantry is but the icing on the cake. The kitchen and spacious family room flow seamlessly to a sunny courtyard for outdoor entertaining, and also to the formal lounge with a cosy gas fireplace and an adjacent reading or TV room. The elegant sweeping staircase leads to three double bedrooms and a study. The upstairs bathrooms are finished to the highest standards, and the master bedroom suite includes a substantial walk-in wardrobe, and a deck from which to enjoy the sights of iconic Rangitoto and the Gulf. This grand home is all about location – with sought-after Takapuna Beach just a 200 meter stroll from the gate. When only the very best will do, look no further. This immaculate, modern home provides an elegant environment for family living and gracious entertaining. Ideally suited to professionals, young retirees or small families, you will enjoy the blend and flow of the formal and informal spaces and state of the art kitchen all unfolding effortlessly to landscaped rear gardens and outdoor entertaining area. An impressive array of top quality French appliances adorn the kitchen and these are complemented by a generous butler’s pantry and excellent separate laundry. The graceful staircase will lead you to three generous bedrooms with the master suite enjoying his and hers wardrobes and sinks, and its own private balcony for enjoying that morning coffee watching the sunrise over Rangitoto. Perfectly positioned in an exclusive cul-de-sac, you will enjoy fabulous Takapuna beach a minute’s walk from your door and the convenience of excellent schools, motorway access and Takapuna township all in very close proximity. Treat yourself today. Excellent blend of indoor and outdoor living; gracious character and contemporary interiors; wonderful beach side location. This list is certainly not complete. It is compiled from electoral rolls, newspaper articles and advertisements, telephone directories, Auckland directories and Wise’s New Zealand Post Office Directory, and the Habitation Index 1981-2008. Children are not normally listed unless they appear in electoral rolls. Dates of residence are only very approximate. This is because some sources, such as the electoral rolls, are published only every three years, and because some of the sources disagree with one another. Wives are listed in electoral rolls but are not recorded in most other sources. Telephone directories are very unreliable, particularly as many wives retain listings under their former husbands’ names. Side of road, or street numbers (after about 1950), are given where known. At some point properties were renumbered. Some residents moved residence within Rarere Road. Quotable Value Ltd. Property info. https://www.qv.co.nz/property-info/property-reports. Auckland Council. Property search – rates and valuations. http://www.aucklandcouncil.govt.nz/EN/ratesbuildingproperty/ratesvaluations/ratespropertysearch/Pages/RatesSearch.aspx. Auckland Star 1919-1945 (via PapersPast). Auckland telephone directories 1915-1985 (Takapuna Sub-Exchange 1915-1926). Bartlett, Jean. Takapuna: people and places. 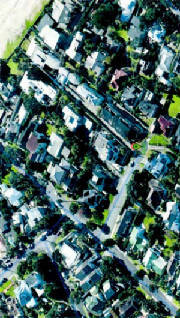 Takapuna, North Shore City Council, North Shore Historical Society, 2001, p. 51. Births, Deaths and Marriages Online (Department of Internal Affairs). Cleave’s Auckland provincial, commercial, municipal and general directory. Auckland, Arthur Cleave & Co, 1911-1929/30. Davenport, John C. Street names of Auckland: their story. Auckland, Hodder & Stoughton, 1990, p. 189. Electoral rolls: Waitemata Electorate 1914-1943, North Shore Electorate 1946-2014. Farquharson, Max. Shops and services. In Devliotis, Cherie. Napier’s Takapuna streets: footprints of the past: an earlier history of streets around Napier Avenue. Takapuna, 2009, p. 83. Habitation index: North Shore Electorate 1981-2008. Leightons Auckland provincial directory. Auckland, Leightons, 1930/31-1941/42. New Zealand Herald 1912-1945 (via PapersPast). North Shore Times / North Shore Times Advertiser. Private hospital in Auckland opened. North Shore Times Wednesday 22 October 1952, p. 2. Sarney, Estelle. Boats and bonfires. New Zealand Herald Saturday 14 January 2006, sect. H p. 21. Takapuna Borough Council. Building permit register 1913-1932, 1932-1950. Takapuna Borough Council, Takapuna City Council, North Shore City Council. Minute Books 1 September 1913–31 October 1989. (Auckland Council Archives – North [TCC 432]). Takapuna Library. North Shore hospitals folder. Verran, David. The North Shore: an illustrated history. Auckland, Random House, 2010, p. 148. Waitemata County Council. Minute Books 3 January 1911-11 March 1914. (Auckland Council Archives – West [A05/2 I05/4303 and I05/4304]). Wise’s Auckland Directory. Auckland, Wise Publications, 1980-1997. Wise’s New Zealand Post Office Directory. Dunedin, H. Wise & Co, 1921-1981 (to 1955 via Ancestry.com.au). Elliott, Robin and Kidd, Harold. The Logans: New Zealand’s greatest boatbuilding family. Auckland, David Ling Publishing, 2001, p. 32-33, 35, 43. Auckland Star Friday 14 March 1913, p. 6 col. G.
 Bartlett, Jean. Takapuna: people and places. Takapuna, North Shore City Council and North Shore Historical Society, 2001, p. 51. New Zealand Herald Thursday 20 November 1913, p. 5 col. B.
 Auckland Star Thursday 4 December 1913, p. 9 col. A.
 Takapuna Borough Council. Minutes of Ordinary Meeting vol. 1, p. 52. (Auckland Council Archives – North [TCC 432/1]). New Zealand Herald Wednesday 14 February 1912, p. 14 col. B.
 Auckland Council Archives – North [TCC 318/1/8]. Held at Auckland Council Archives – North. New Zealand Herald Saturday 9 June 1917, p. 1 col. F.
 Auckland Council Archives – North [TCC 318/3/223]. Auckland Council Archives – North [TCC 318/7/670A]. Archives New Zealand Wellington Office item R20963154 (1936-1957). New Zealand Herald Monday 11 May 1936, p. 18 col. F.
 Evening Post Friday 24 December 1926, p. 24 col. B.
 Kai Tiaki: the Journal of the Nurses of New Zealand vol. 16 no. 1, January 1927, p. 51. New Zealand Herald Saturday 13 April 1940, p. 2 col. D.
 Archives New Zealand Auckland Office item R6901608 (1936-1943). Births, Deaths and Marriages Online (Department of Internal Affairs) 1895/5463. New Zealand Herald Saturday 12 February 1944 p. 1 col. A. New Zealand Herald Saturday 6 May 1944, p. 9 col. F.
 Archives New Zealand Auckland Office item R10524442 (1944). New Zealand Herald Saturday 16 June 1945, p. 1 col. G.
 Archives New Zealand Auckland Office item R6901609 (1944-1947). New Zealand Herald Saturday 14 April 1945, p. 11 col. G.
 Archives New Zealand Auckland Office item R20336711 (1946). North Shore Times Wednesday 22 October 1952, p. 2. Archives New Zealand Wellington Office item R20963153 (1957-1965). Archives New Zealand Auckland Office item R21422650 (1964). Archives New Zealand Auckland Office item R6345368 (1952-1966). Archives New Zealand Wellington Office item R16651877 (1966-1984). Auckland telephone directories until 1984. Auckland Council Archives – North [NSC 103/184/615436/P-1-21-29]. North Shore Times Advertiser Thursday 12 May 1988, p. 3. Shore News v. 2 no. 18, Monday 23 May 1988, p. 9. New Zealand Herald Friday 13 January 1995, sect. 1 p. 10. North Shore Times Advertiser Tuesday 17 January 1995, p. 2. Takapuna Borough Council. Minutes of Ordinary Meeting Wednesday 21 June 1933. (Auckland Council Archives – North [TCC 432/1]). Determination regarding a code compliance certificate for a five-year-old house with monolithic cladding at 6A Rarere Road, Takapuna. Wellington, Dept of Building and Housing, 2009. 12 p. (Determination 2009/88). http://www.building.govt.nz/userfiles/file/building/determinations/2009/2009-088.pdf. Gregory & others v EK Trust Ltd & others: judgment of Katz J.  NZHC 1785, 31 July 2015, para 20. Hepburn, Graham. Hidden treasure. New Zealand Herald Friday 31 March 2006. http://www.nzherald.co.nz/property/news/article.cfm?c_id=8&objectid=10375435. North Shore Times Advertiser Friday 23 October 1998, p. 24 (advertisement). Oram, Ric. Millions paid for waterfront. New Zealand Herald Wednesday 11 November 1998, Sect. C p. 1. Morgan, Andrea. Spectacular Takapuna Beach contemporary home, NZ. 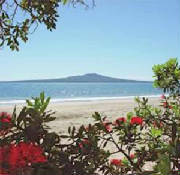 https://tryingtobalancethemadness.wordpress.com/2012/08/25/spectacular-takapuna-beach-contemporary-home-nz/. Eriksen, Alanah. New Zealand Herald Thursday 26 December 2013. http://www.nzherald.co.nz/alanah-eriksen/news/article.cfm?a_id=344&objectid=11177868. New Zealand Herald Wednesday 26 July 1995, sect. 2 p. 5.